Whether you need to blow away competition or require a stunning website design to inform people about what you do, we provide fully bespoke web design crafted for your audience and built around your needs. 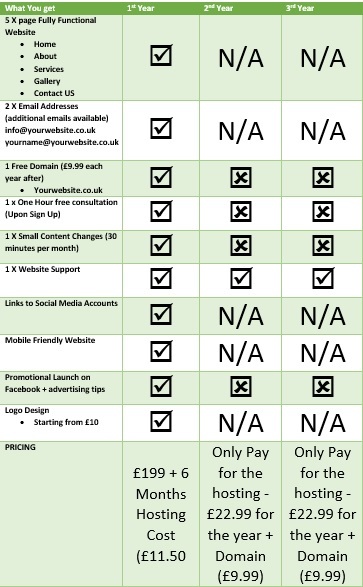 Whilst there are many companies that will tell you it costs a lot more money to make the website than it actually does. We are not one of them, we are quite clear about our pricing and there are no hidden fees!! From simple portfolio websites to big e-commerce websites we can offer them all at a competitive rate. 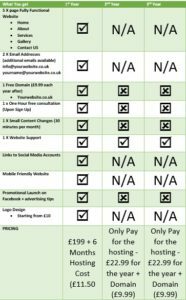 For small businesses who don’t require a big complicated website we offer our “What you get package” which is a fully working website that comes with 6 months free hosting and everything you need to get going. See the table below for a breakdown of what you get. For the people who want something a bit more unique please contact us directly so that we can offer you a competitive price.